90% & 40% US Silver Coins. Is excited to present you this splendid 2017 (S) 1 oz Silver American Eagle Coin NGC MS 70. 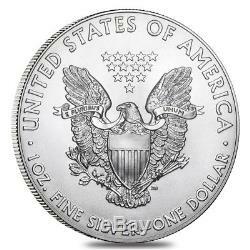 The American Eagle silver coin was first introduced in 1986 after being authorized by the Liberty Coin Act of 1985. The coin has been awarded legal tender status which makes it safe for investment. This beautiful coin is struck from. 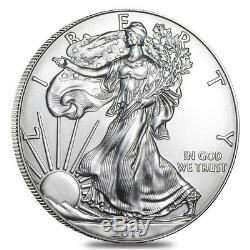 999 fine silver, featuring the highly recognizable design of Walking Liberty created by famous illustrator Adolph A. During those years, the production of Silver American Eagles traditionally took place at the West Point Mint facility, which is also home to a strategic bullion depository. However, facing a record demand for American Eagles, the U. Mint decided to use their San Francisco facility in 2011 and Philadelphia facility in 2015. Despite their location of origin, the mintmark on all American Silver Eagles was omitted. The details about the mintage facility were not released to the public until 2017. For that reason, the Mint location could only be known with the information on their 500-coin packaging boxes, commonly called "monster boxes". 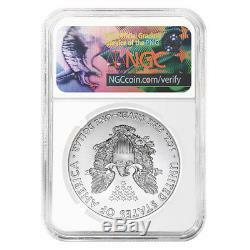 The method used by NGC and PCGS is as follows. 2015 Philadelphia Mint boxes (79,640 pieces only) have a five digit serial number starting with the number 1. Important: Do not confuse this with boxes that have the "WP" prefix, which are struck at the West Point Mint. 2017 West Point Mint boxes have a six digit serial number starting with the numbers 1, 2 and 3, or a five digit serial number starting with the prefix WP. 2017 San Francisco Mint boxes have a six digit serial number starting with the number 4. The Numismatic Guaranty Corporation (NGC) subsumes these coins with a mintmark and the facility name, for example, a coin struck at the San Francisco Mint in 2017 will be described as a. This title comes with NGC designations and other special labels. The Professional Coin Grading Service (PCGS) provide the mint attribution by using "S" for San Francisco, "P" for Philadelphia, "W" for West Point, e. 2017-(W) and their original labels. Bullion Exchanges is delighted to offer our customers the entire collection of PCGS/NGC graded. With the mint locations revealed. 999 pure silver, weight of 1 troy ounce. NGC MS 70 - A coin with no post-production imperfections at 5x magnification. Coin was minted at the San Francisco U. Actual coin does not have'S' mintmark. Housed in NGC Standard Brown label. Obverse: Displays Lady Liberty moving towards the sunlight while holding a laurel oak in her hand, symbolizing America's strength. Inscriptions include "LIBERTY, " "IN GOD WE TRUST, " and the year of mintage. Reverse: A heraldic eagle below 13 small stars, which represent the original American colonies. Inscriptions include "UNITED STATES OF AMERICA, " "E PLURIBUS UNUM, " along with the weight and denomination. You can feel confident that you will get bullion coins of superior quality. Every silver coin from our bullion selection is 100% authentic, like this astounding Silver Eagle. 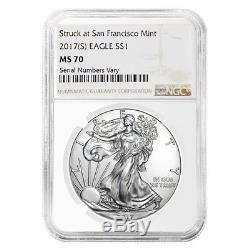 Order this stunning 2 017 (S) 1 oz Silver American Eagle Coin NGC MS 70 today and you will get it thoroughly wrapped and packaged to be safely delivered to your address. By purchasing from Bullion Exchanges, you are agreeing to all of our Terms and Policies. Bullion Exchanges reserves the right to refuse or cancel any order reviewed by our Compliance Team, which are deemed questionable or have increasing potential risk for being fraudulent. All customers are subject to a review at our own discretion, in which additional information, identification and/or documentation, may be requested. A prompt response would help expedite the fulfillment of your order. Packages are no longer insured if the tracking information shows the package is delivered. We will only be liable to cover packages that are lost in transit or damaged. There are no exceptions to this policy. Once an order is placed, it cannot be modified or cancelled. Using high definition digital video, we record the packing of our products to affirm accuracy. Bullion Exchanges reserves the right to refuse or cancel any order reviewed by our Compliance Team, which are deemed questionable or have potential risk for being fraudulent. The submission of an order and subsequent receipt of a confirmation locks in your order and affects our metal hedging requirements and thus we are unable to make any price adjustments. Our in-house numismatist staff assign conditions to all products. Purchasing bullion and/or coins involves price risk, and the purchaser assumes all such risk. We do not offer or make price adjustments based on the market fluctuations of precious metals, or for any other reason. We will never ask the customer to pay more for a product if the price significantly increased, so please refrain from requesting price adjustments after market prices decrease. The item "2017 (S) 1 oz Silver American Eagle $1 Coin NGC MS 70" is in sale since Friday, November 10, 2017.